The World Championships in Saitama have come and gone, and it all feels a bit like a sleep-deprived dream. I did manage to stay up and watch all the pairs live. The things I do for skating. It feels like it’s been a long time coming… maybe almost too long? I did feel that some teams here would have benefited from the season being not quite so long, although the reserve is also true, it helped other teams. It’s all comes down to the very difficult balance of maintaining form and peaking at the right time – what a contradiction! While it wasn’t perhaps the best skated competition – the free programs in general were a bit rough, a bit nervy, with the exception of the final flight – it certainly delivered in suspense. It did not turn out to be anti-climatic! Actually, I think on the whole I was pleasantly surprised with the teams at Worlds and how they are all developing. I think everyone is making improvements. It was too bad that the field was small, especially now that the free skate has been expanded to 20 teams. It really should have been 21 teams (still on the small side) but Suzaki/Kihar and Alexandrovskaya/Windsor were both out with injuries. I guess the upside is that everyone made it to the free skate – great experience in itself – instead of one lone team being left out. That would have felt very sad. It also meant that I could kind of keep my cool during the short program in the knowledge that teams with wonderful, clean skates were not going to cut. So, in the end, it was a bit of a win-win. I don’t think I can hide that I wanted my Chinese teams and Baby Russians to skate well and receive the love and adoration from the judges they so richly deserve. I also really was looking forward to James/Cipres skating their way to a gold medal. (It seemed in the cards.) All my dreams did not come true but there were still some things that made me very happy. I just want to do some commenting on Junior Worlds before Senior Worlds is upon us. I mostly cared about the pairs, like I do, so that is what I am going to focus on. With the difficulty and risk the these pairs are attempting while still pretty new and young, it was nice to see a lot of good skating. The podium was a Russian sweep, as expected. They are all very strong teams but it was interesting to see how these teams fared against each other and dealt with the close competition between one another. It was also good to see these teams after a long break, at least for the fans, since the Grand Prix. You could see that many teams have improved in the past four months. I think we are at the point in the figure skating season when we should take some time to go over our favourites. A number of skaters are already done their season, while for others there is really only the World Championships left. We may only see the programs one more time! I hope my favourites all get a good send off. When I think about favourite programs, it tends to be a combination of things that win me over. It’s really the packaging all together – music choice, costume, choreography. However, it’s also about how well it is skated and performed. In the end though, beautiful, creative choreography, so well suited to the music, wins the day. These are the short programs I have really been enjoying this season. Don’t be surprised that this list is dominated by Japanese women. I know we’ve all been focused on Russian women for the past little while but I really think the Japanese women have the depth, consistency and sustainability to dominate this quad. Satoko, Wakaba, Rika, Mai, Kaori, Marin… We really are spoiled. With all the National and European and Four Continent and other competitions going on, I have fallen seriously behind in pairs figure skating. I have quickly discovered that I just cannot keep up with recapping competitions. (The Grand Prix season nearly killed me). But I do love pairs, so I just have to talk about them, and now that we have a bit of a break before Worlds, this might be a good time to review field and see where our teams are at. The pairs field has thinned out this season with retirements and splits and recovery from injury, as is typical following an Olympic season, so we don’t have the same depth that we saw, say last season, but it doesn’t mean it isn’t a good field. We have some excellent teams competing. 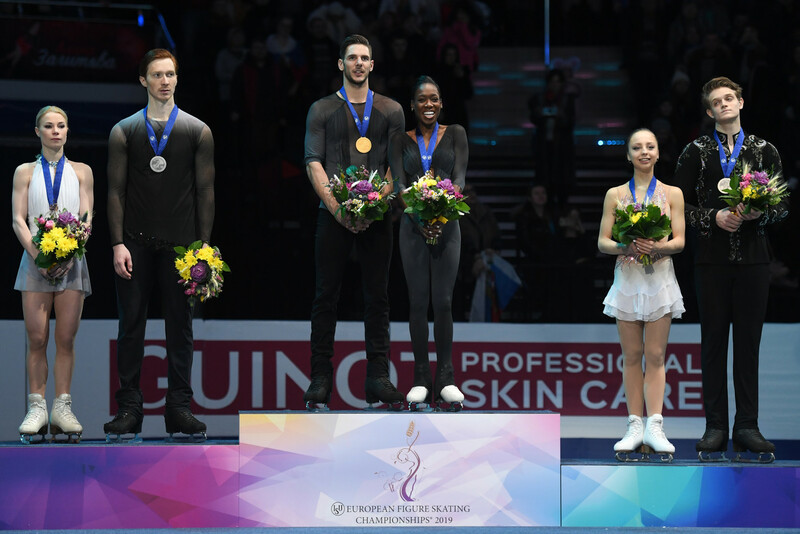 I’ve discussed the pairs at Russian Nationals here but I went on a bit of a rant about the US pairs here, but I haven’t commented on either Europeans or 4CC – first note: I was quite happy about both those podiums – so let’s do a run down. You have to admit this photo is kind of hilarious. Some people look happy. It’s my favourite time of the year! That’s right, it’s Russian Junior Pair time. We are going to take a look at the pair field at the Russian Junior Nationals and a few others besides, and check in on how the field has changed in the past year. In preparation for the most wonderful time of the year, I have been trying to get my teams and their faces and costumes and names and coaches straight. I think I’ve figured everyone out but even if I don’t remember all their names yet, there are so may promising Junior Pairs! The competition was seriously good. Out of eleven teams there were only two falls in the short program (one jump, one throw). The free wasn’t quite so impressive – we started to see some pair lady tendencies come through – but with just five falls out of 22 skaters (almost entirely on jumps) and no failed or dicey lifts or bizarre element mishaps, it was quite a treat! The pairs we see saw on the Grand Prix we saw again here (for the most part) but represent just a small portion of the field – usually they are considered the best but Russia really maxed their chances of qualifying their teams to the final, giving double assignments to five teams, and leaving a number of up and coming teams without the chance to compete on the Grand Prix this season. Yet, with their performances here and in other competitions, hopefully we will see them in the future. Fingers crossed! We have to remember that the field is incredibly deep – you can see how competition breeds a robust field – and at the same time that there are no guarantees here. At the rate the field changes it’s unlikely that we will see many of these teams make it to Seniors, although we may see some of the skaters. Aside: I have been trying to make sense of the Cup of Russia series and I am not making much headway. What is the difference between the MC and KMC classes? (Let’s be clear: I’m dependent on Google translate here.) Normally I would guess Senior and Junior but most teams seem to cross the lines very easily and compete in either class and switch from competition to competition. But mostly, I don’t understand how a team qualifies for Junior Nationals. There are so many teams that don’t make it. What do you have to do? Earn points, placements, complete an obstacle course? I want to know. Note: Three teams did withdraw, two far enough in advance to allow for replacements, but the field ended up one team short because one team was forced to withdraw due to illness at the competition. I don’t know the reasons for the earlier withdrawals. I can only speculate injury but I don’t actually know.